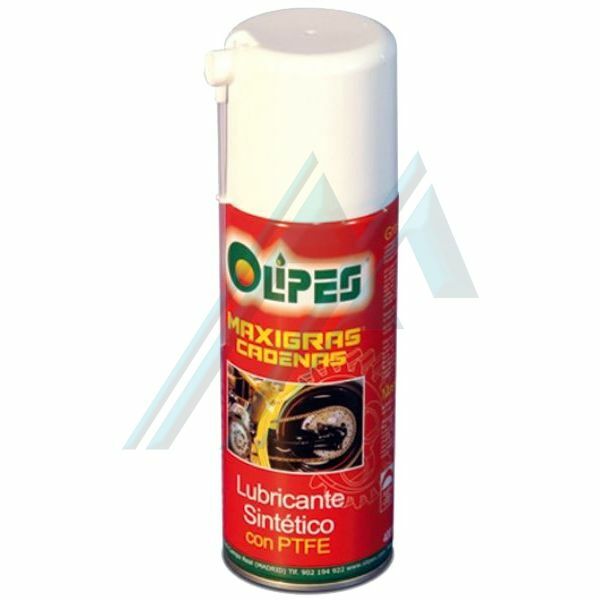 Maxigras Chain grease is a teflon (PTFE), of light color in Spray, specially formulated for the lubrication of Chains subject to high impact and adverse weather conditions (water, snow, dust, mud, etc). Maxigras Chains eliminates the annoying noise of the hinges of the doors in the car, and lubricates in depth covers of steel wire braided cables, brake and clutch, lock centralized, guaranteeing the maximum length of the elements lubricated. Maxigras Chains is especially recommended for the lubrication of chains and motorcycle chains and masts of forklifts by its low tendency to dust collection and its long-lasting, even under the conditions of temperature and effort ends and in the presence of moisture and water. The exclusive formula of Maxigras Chains facilitates the application and penetration into inaccessible areas and thanks to its quick drying ensures an anchor perfect in the areas lubricated. Maxigras Strings it has a high capacity anti-corrosion, antioxidant and anti-wear. The additives of Maxigras Chains ensure a very smooth and its high content of PTFE ensures the formation of a lubricant film stable and durable. Maxigras Chain resists high pressures and the aggressiveness of a large number of chemicals. The formula anti-dust Maxigras Chains is compatible with all types of rubbers, seals, elastomers and paints. Temperature of application and working: -35°C to +150°C (+31°F to +302°F).